1. Could Andrew Meyer have acted in a little more cooperative manner? Sure, but in comparison to any heated civic “town hall” meeting that has some person addressing the council about potholes on their street, Andrew’s behavior was very calm and collected. 2. Senator Kerry tried to defuse the situation by saying he would answer Meyer’s 3 questions. That could have ended everything right there, except in today’s world where asking questions is frowned upon; especially in an alleged “place of higher learning.” Hell, there was a time when I was taking a literature class at URI. One student would constantly disrupt the professor, her fellow students, and the class several times a day while she assaulted us with opinions, dialog, and psycho-babble concerning a book called “The Women’s Room.” If any college student was ever more deserving to be “tased,” it was her……except we sucked it up, rolled our eyes and went on with our lives knowing that we allowed an exchange of ideas; as painful as they may have seemed. 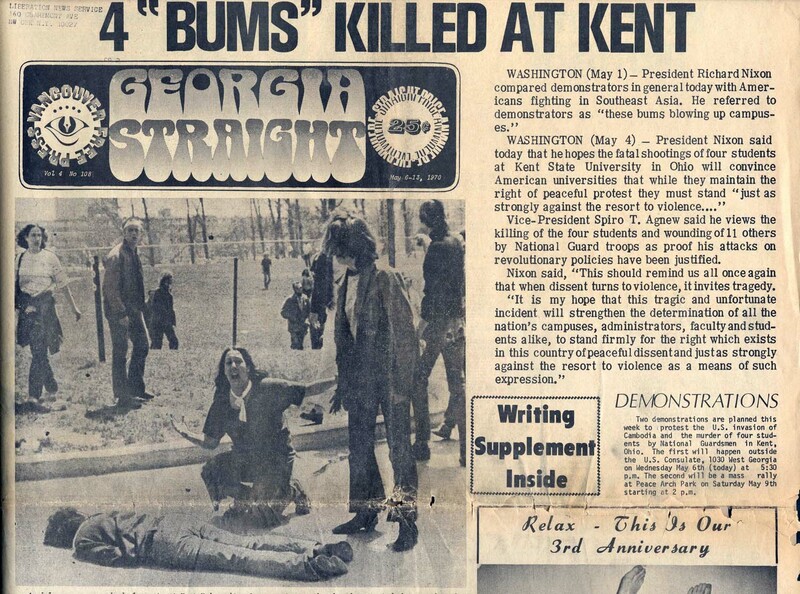 May 4th, 1970, was the date of the student massacre at Kent State. The Ohio National Guard shot, and killed 4 unarmed students and wounded 9 at a protest of the Vietnam War. I had never seen the above newspaper headline clipping matching the now famous picture, but why am I not surprised for the lack of respect for the human race. Most college actions plans addressing protest,and unrest from students are based on those horrific events to gauge and minimize undue violence to all on the college campus. The University of Florida must have lost that book. I’m from BC and I remember that headline and the Georgia Straight. A great paper. I remember this very well. The guy was bit arrogant at first (if I remember right) but there was no need for the taser. True……but 6 security guards should be able to handle one college student who wants to talk! Maybe the guy should start a blog……hahahaha!